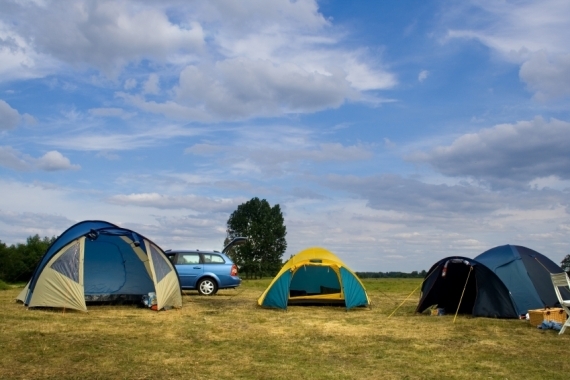 GM shows fun-to-drive and fuel-efficient aren't mutually exclusive. In the American lexicon, economical is nowhere near synonymous with enjoyable. Blame it on the sort of transportation travesties the country suffered through the early to mid-‘80s or the obvious lack of small, fun to drive cars in the land of the free, but something in the American mind simply can’t put the two terms together. Or at least it used to be that way. General Motors has unleashed a rash of new, fuel-savvy cars that pass on the pump while still doing more than simply survive interstate traffic. 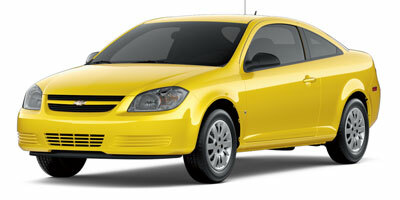 The 2009 Chevrolet Cobalt LS XFE is a prime example. With 155 horsepower on tap from a 2.2-liter four-cylinder engine, the coupe has all the guts it needs to put a smile on your face, but still delivers an EPA-estimated 37 mpg highway. Make no mistake, the interior makes sure you know this is basic transportation, however, the drive is anything but. There’s plenty of power for a fuel miser and the well-planted suspension makes the car actually enjoyable to drive. Despite the EPA rating and a low MSRP, the Cobalt LS XFE doesn’t look like the rest of the dweeby compacts out there, either. A decent dose of style and fuel economy that bests segment titans like the Honda Civic make this a smart choice. GM has a lot of work to do to get the Cobalt’s interior up to par with the rest of the competition. Cheap materials and poor assembly plague the car’s cabin. Though the standard five-speed transmission makes the best of the car’s power, it can be clunky and difficult to get into first gear. A lack of standard equipment is also a negative. Under normal commuting conditions, the Cobalt’s 2.2-liter four-cylinder engine serves up plenty of torque and is quiet as can be. A helpful shift light prompts the driver to shift at or below 2,000 rpm and, surprisingly enough, the engine seems to thrive at this range. The ride is comfortable without any sort of suspension wallow and the brakes do their job without breaking a sweat. 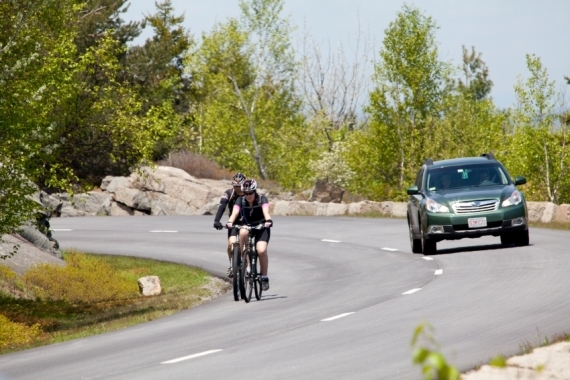 Shirk the four-lane for more twisty tarmac, and you’re rewarded with a light-weight, pitchable machine that likes to hang out in the upper reaches of the power band. The LS XFE weighs more than 200 pounds less than the powerful Cobalt SS, and while the lack of weight doesn’t quite make up for the horsepower gap, it does make the LS XFE surprisingly fun from behind the wheel. 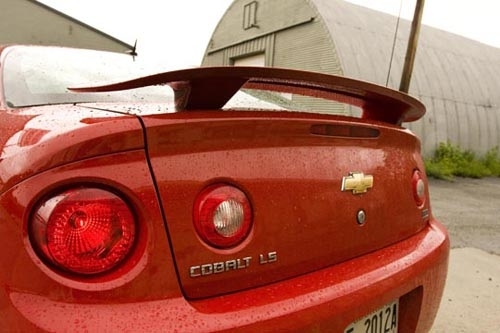 The Cobalt LS XFE is powered by a 2.2-liter Ecotec four-cylinder engine with 155 horsepower and 150 lb-ft of torque. Despite the relatively large displacement, General Motors has managed to squeeze an impressive amount of fuel economy out of the car without impacting power. The standard gearbox is a five-speed manual transmission that sends power to the front wheels. 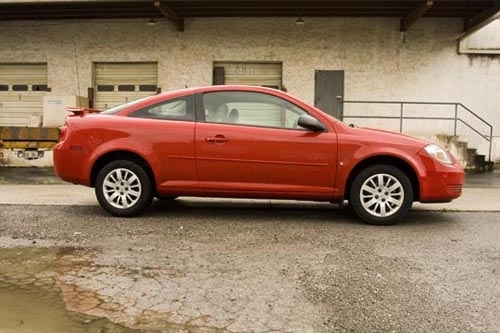 The 2009 Chevrolet Cobalt LS XFE is the definition of basic transportation. Forget power locks, power windows or cruise control. Those sorts of options will require stepping up to the LT trim. You can choose a sport appearance package, a separate spoiler, floor mats and spare tire from the option sheet, though. Don’t expect any fancy gadgets on the LS XFE. In GM-speak, LS means base, affording buyers little in terms of entertainment. SIRIUS Satellite radio, complete with an MP3-capable CD player with an AUX jack comes standard and so does three months of OnStar. Don’t expect any sort of hands-free calling, though. For that you’ll have to step up a trim level. If the Cobalt LS XFE shines anywhere, it’s here. The car manages to serve up 25 mpg city, 37 mpg highway for 30 mpg combined. Those figures are good enough to put this coupe ahead of the small car pack. GM seems to have balanced the fact that the Cobalt LS XFE doesn’t drive like an economy car by gracing it with a sub-par interior. Cheap-feeling plastic panels and flimsy interior door releases outweigh the comfortable, supportive seats and massive trunk space. 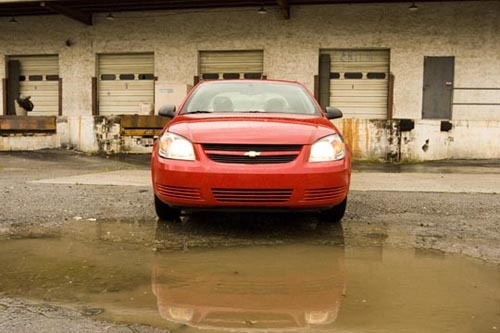 Outside, this Chevrolet is attractive enough, though the front fascia could benefit from the redesigned family nose we see on both the Malibu and the Aveo. Cool round tail lights and an optional spoiler add some flair to the design. Another one of the Cobalt LS XFE’s strong suits, the car is priced starting at $15,660, though adding necessities like floor mats and a spare tire will nudge the price closer to $16,000. That puts this Cobalt in line with the Honda Civic DX at $15,305, the Nissan Sentra at $15,350 and the Ford Focus Coupe at $16,400. Still, the competition boasts around 15 less horsepower than the Cobalt as well as marginally worse fuel economy. 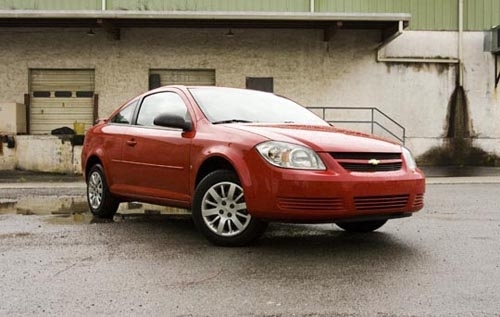 With a low price tag, stellar fuel economy and more power than you’d expect, the 2009 Chevrolet Cobalt LS XFE has plenty to offer those looking for a way to take a chunk out of their monthly fuel consumption. While a lack of standard equipment and the unimpressive interior may be turn-offs, this is a great car for commuters and young drivers alike.